Leveraged loans historically have generated positive returns in rising rate environments, but they also have tended to perform well when rates do not rise. In years where rates did not rise, loans have generated positive returns six out of nine times. While interest rates are generally lower than they were a generation ago, leveraged loans are still one of the strongest performing asset classes on a risk-adjusted basis since 1992. 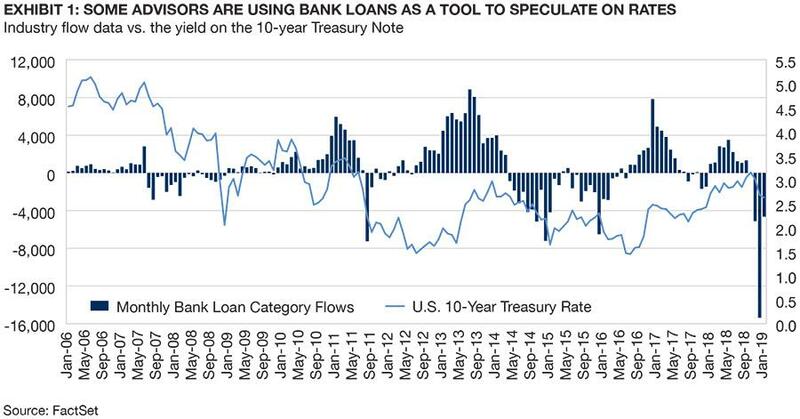 Investors who sold their leveraged loan funds into recent downdrafts (in favor of cash-equivalents or ultra-short duration funds earning less) eventually saw those loan funds rally. We would strongly argue leveraged loans act as a powerful diversifier to a fixed income portfolio. 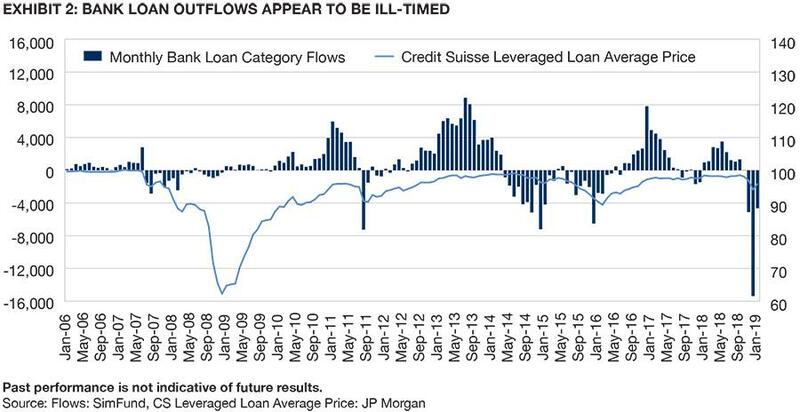 As many investors have seen recently, the mass exodus of leveraged loan flows that peaked in 4Q2018 has continued into 1Q2019 (though at a slower pace), despite a strong recovery off the bottom. Consider Exhibit 1, which compares industry flows to the 10-year Treasury. It shows that as rates move, the flows into/out of the asset class change dramatically. We believe that this is not an appropriate strategy and the asset class should be owned, not traded, and works regardless of interest rate trajectory as long the economy is doing well. Exhibit 2 suggests that investors routinely exit the asset class as loan prices are dropping or have dropped below par—just as they have room for capital appreciation. Conversely, investors seem to love the asset class most when loan prices are close to par and room for appreciation is minimal to non-existent. Remember: fundamental factors are much more important than the trajectory of rates. Outside of the 4%+ move already experienced since the bottom on December 24, 2018, there are plenty of instances when leveraged loans performed well even as rates fell (which is the majority of the time the asset class has existed). 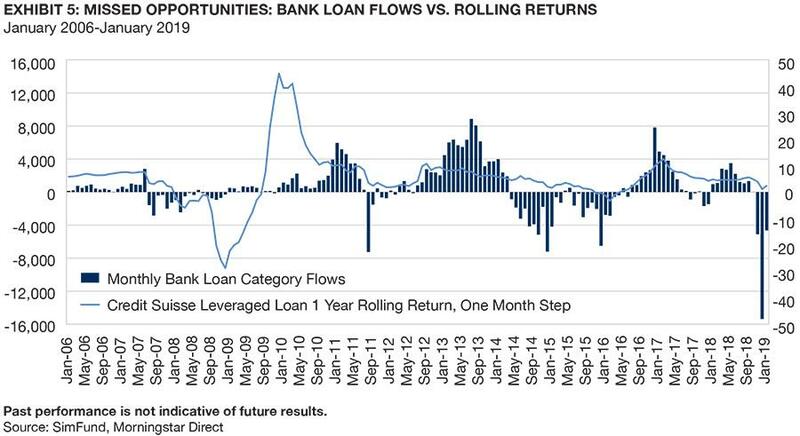 During the four largest downdrafts in the U.S. 10-year rate in the last 10 years, leveraged loans (as represented by the Credit Suisse Leveraged Loan Index) were up each time, with an average return of 2.1%. Despite generally falling interest rates (remember: the 10-year was at 7-8% back in 1992), leveraged loans still rank as one of the best performing asset classes on a risk-adjusted basis (see Exhibit 3). 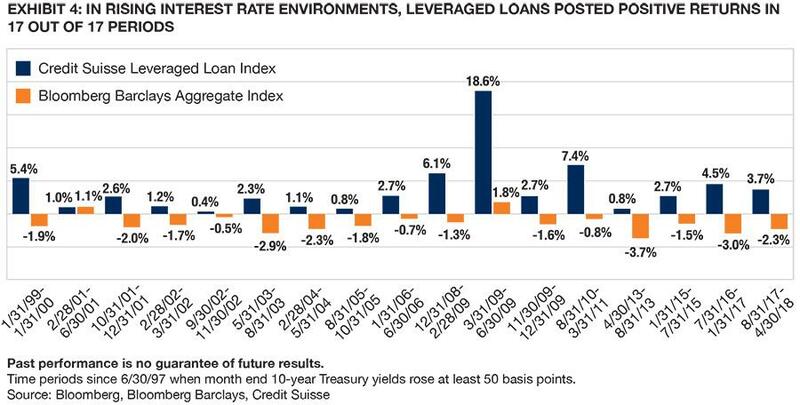 Also remember the number of times leveraged loans have performed well in rising interest environments. (See Exhibit 4). Finally, Exhibit 5 shows rolling returns vs. flows, where you can see some performance chasing as the 12-month rolling return has gone up/down. As investors sold out during the financial crisis, 2011, and 2015, they missed out as the asset class generally went on to see strong results. While it is well documented that leveraged loans have done well in periods of rising rates, we believe that now is the time to consider leveraged loans as a powerful diversifier in a fixed income portfolio. Investors would be well-advised not to get hung up on the direction of interest rates. Predicting which way they’re heading is difficult, and central bank intervention makes it even harder. As a result, many investors who sold their loan funds into a downdraft have watched those funds rally—with their redemption proceeds tucked in cash-equivalents or ultra-short duration funds earning less. We believe that should spell opportunity for active managers of leveraged loans with long-term records of strong risk-adjusted returns. Bloomberg Barclays U.S. Aggregate Bond Index measures the U.S. investment grade fixed rate bond market. The index is calculated on a total return basis. Bloomberg Barclays U.S. Corporate High Yield Bond Index is an unmanaged market value-weighted index that covers the universe of fixed rate, non-investment grade debt. Credit Suisse Leveraged Loan Index is a market-weighted index that tracks the performance of institutional leveraged loans. S&P 500® Index is a free-float market capitalization-weighted index of 500 of the largest U.S. companies. The index is calculated on a total return basis with dividends reinvested. Russell 2000® Index is a market capitalization-weighted index of the 2,000 smallest companies in the Russell Universe, which comprises the 3,000 largest U.S. companies. The index is calculated on a total return basis with dividends reinvested. The indexes are unmanaged, their returns do not reflect any fees, expenses, or sales charges, and are not available for direct investment. A Basis Point (bp) is equal to 0.01%. Average Coupon is the weighted average coupon (annual rate of interest on the bond’s face value that the issuer agrees to pay the holder until maturity) of all the securities in a fund. Standard Deviation is a statistical measurement of dispersion about an average, which depicts how widely returns varied over a certain period of time. The commentary is the opinion of Seix Investment Advisors. This material has been prepared using sources of information generally believed to be reliable; however, its accuracy is not guaranteed. Opinions represented are subject to change and should not be considered investment advice or an offer of securities.